Our planet is imperiled as perhaps never before by global warming and other environmental threats. It is urgent that steps be taken immediately to avoid the unprecedented catastrophe toward which the world is rapidly heading. Jewish Vegetarians of North America (JVNA) has produced a major documentary about how Jewish teachings can help address current environmental crises. 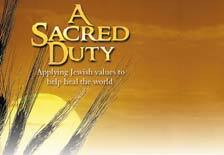 While this one-hour documentary -- entitled A SACRED DUTY: Applying Jewish Values To Help Heal the World -- is especially suitable for synagogues, temples, JCCs, Jewish schools and other Jewish institutions, its universal message also makes it appropriate for showings at Christian, other religions' and secular institutions, and at film festivals. A SACRED DUTY speaks to people everywhere about the ethics of our relationship to our natural world and why it is imperative that we respond quickly to help shift our imperiled planet to a sustainable path. Key climate scientists, including James Hansen of NASA, warn that we may reach a tipping point within a decade after which global warming could spiral out of control, with disastrous consequences. Recent reports, including the landmark "Livestock's Long Shadow," by the UN Food and Agriculture Organization, highlight the disastrous contributions of modern, intensive animal-based agriculture to this crisis. Israel's special vulnerabilities to global climate change, in terms of reduced rainfall, severe storms and flooding from a rising Mediterranean Sea make this documentary urgent and timely. A SACRED DUTY is a Jewish response to these issues. It reminds us that it is our sacred duty to become aware of these realities and our responsibility to apply Jewish teachings to how we obtain our food, use natural resources, and live among other creatures whom God created. It offers simple, practical measures for reducing our impact on the planet. Alon Tal - Leading Israeli environmentalist; founder of the Israel Union for Environmental Defense: author of Pollution in a Promised Land. Lionel Friedberg, producer/director/writer/cinematographer: 18 feature film credits as Director of Photography. Awards include A Primetime Emmy, a National Emmy, the American Association for the Advancement of Science 'Westinghouse' Award for Science Programming, three Columbus and three Golden Eagles for Best Documentaries, and various awards as a dramatic and episodic TV director. Watch The Film World of Lionel and Diana Friedberg. To obtain a free DVD copy of the movie, please contact us. As a non-profit organization, JVNA will make the movie available free of charge to religious groups, educational institutions, environmental organizations, cultural clubs, the media, Jewish Film Festivals, and others who will arrange showings.